We are honored to be contacted by passionate members of our community who want to organize an event or campaign to raise awareness and funds benefiting Komen Missouri. We encourage you to be creative! 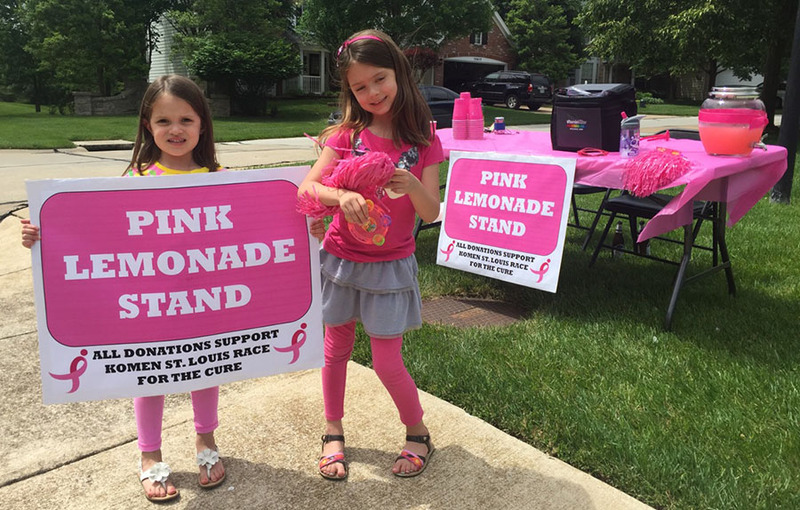 The choices are endless (pink lemonade stands, jeans days and more! ), but the results are the same: supporting Komen Missouri and making an impact in the fight against breast cancer. Step 1: Read and fill out the Guidelines and Application, which will help you in planning your event or campaign. Step 2: Still have questions? Contact the affiliate office at 314-644-5400 or email at info@komenmissouri.org. All proposed fundraisers are reviewed on an individual basis. Depending on the time of year, it may take up to 72 hours before you hear from Komen Missouri. Please note that you may not begin promoting your event until you have a signed agreement. Rally for the Cure® is a grassroots program that works to educate women about breast cancer and to remind them to get their annual screening through volunteer-organized golf, tennis and social activities. You choose the date and activity to Rally around. Learn how you can become a Rally Ambassador.